Are you looking for ways to simplify or change your holiday decorations this year? I think Christmas plants are such a great way to decorate naturally (no pun intended). They are easy to display and with a little care they will last a long time too. They have the added benefit of being a natural air freshener as well. Use them as a focal point or tuck them in with other plants & decorations for a quick accent or centerpiece. They make great gifts too. Poinsettias are one of the most popular Christmas plants & often given as gifts. While red is always popular there are many colors to choose from. Their bright colors are gorgeous & long lasting. They come in many sizes from small pots – that will make a nice centerpiece – to very large pots – that make a statement. Place them in bright light & keep the soil moist by watering regularly to keep them looking their best. They do not need fertilizer during the holiday season. Be sure to slit the foil wrapping & place on a saucer so they can drain properly. Do not leave them sitting in water. One other thing to note … poinsettias are NOT poisonous. This has been documented & proven through extensive research by Ohio State University. Hellebores ‘Jacob’ are a new Christmas plant that we began carrying last year. It is a perennial that blooms inside AND outside during the holiday season. Their blooms are a bright white that fade to a lime green. From Dec. to February they will put on a show of white blooms that just keep popping up. Once they have finished flowering, you can keep them in a cool spot until March/April when the ground thaws. You can then plant them outside in your shade garden where they will be a deer resistant groundcover until next Christmas when they bloom outside in your garden. Christmas Cactus are often thought of as a plant your grandmother loved, however they can look very stylish & beautiful today. They are very easy & rewarding to grow making them a wonderful houseplant all through the year even when they are not blooming. Place them in a bright spot near a window. Keep the soil moist while they are in bloom & then let the soil dry between watering when they are done blooming. 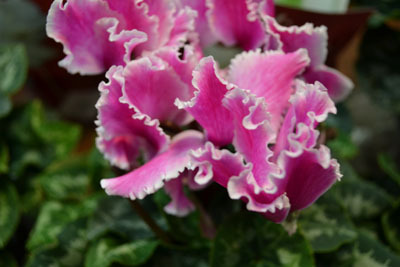 Cyclamen are a wonderful blooming houseplant that is often used at Christmas time but is not specifically thought of as a Christmas plant which makes it a great gift for friends of other faiths. Their blooms are very dramatic rising above a mound of silver foliage. They will bloom for many months if kept consistently moist & they appreciate a cooler room or drafty spot if you have it. Amaryllis are dramatic & beautiful. Grown from a bulb you can purchase them ready to bloom for decoration or as a kit for gifts that your loved ones can watch grow & bloom later this winter. Allow the soil to dry slightly between watering then water thoroughly. You can keep them as a houseplant & then rest the bulb in late summer so they will bloom again next year. Paper Whites are also grown from bulbs. Allow 4 – 5 weeks for them to bloom after they are planted in soil or gravel. Their stunning white blooms are fragrant which is appealing to some & not to others. They are beautiful when decorated with a few sprigs of winterberry. After they finish blooming, the bulbs have ended their lifecycle so just dispose of them. We have them ready to grow in pretty bowls & other containers which make gift giving easy. I encourage you to stop in for inspiring ideas on ways you can use holiday plants in your home. Then be creative & have fun decorating with them.